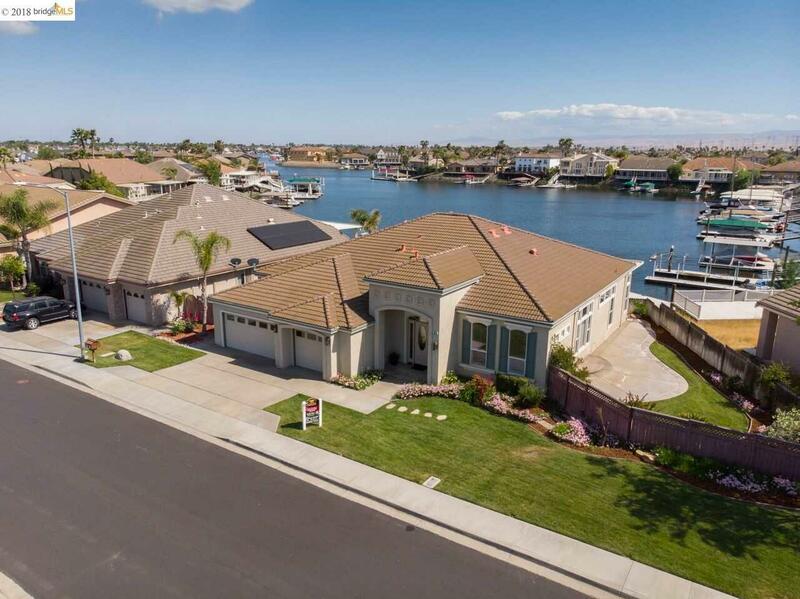 DEEP WATER SINGLE STORY MIRAMAR PLAN 2! RARE...One of the Few Lots Tucked Away on A Quiet, Private Street with Minimal Traffic & NO Front Facing Neighbors! This Home Could Easily Accommodate an In-ground Pool on the Side Yard, as well! Interior Features 2,957 Livable sqft, 3 Bedrm + Lrg Office + 2.5 Bath + Over-sized 3 Car Gar w/Built-In Storage! Boasts a Wide Open Floor Plan with High Ceilings t/o, Formal Dining Area Plus Family Rm/Kitchen 'Great Room' Concept w/Raised Hearth Stone Fireplace, Media Niche and Hardwood + Tile Flooring in All the Right Places. Gourmet Kitchen w/Stone Counters, GE Monogram SS Appliances, Newer Samsung Built-In Smart Fridge, Gas Cook Top w/Hood, Wine Fridge, Massive Eat-Up Center Island & Walk-In Pantry. Master Suite with Water Views Provides a Cozy FP, Coffee Bar, Huge Walk-In Closet, His/Her Vanities & Soaking Tub w/Jets. Step Out Back to Enjoy Hours of Entertaining on the Large Covered Patio/Vinyl Deck with an Adjoined U-Dock for All Your Boating Needs!